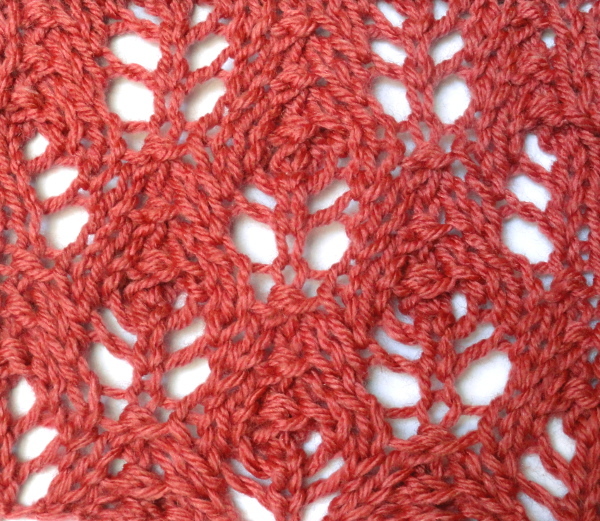 The Lacy Floret stitch is a lace stitch pattern which resembles flower buds situated one above the other running vertically across the work. This stitch is not a complicated stitch with basic increase and decrease techniques. Like most lace stitch patterns, the Lacy Floret stitch has excellent drape and is great for many patterns especially Spring and Summer knits. Row 1 (RS): k3, *yo, k2, p3tog, k2, yo, k1; rep from * to the last 2 sts, k2. Repeat Rows 1-2 two more times. Row 7: k2, p2tog, *k2, yo, k1, yo, k2, p3tog; rep from * to the last 9 sts, k2, yo, k1, yo, k2, p2tog, k2. Repeat Rows 7-8 two more times.